Historian Charles R. Shrader borrows a quote to describe the First Indochina War between Viet Minh and French Union forces as a “war in which logistics decided the outcome.” His research backs up the quote in the sense that poor logistical support can defeat an army. There’s no doubt about the depth of Shrader’s research; it’s evident in the seventy pages of notes in his book, A War of Logistics: Parachutes and Porters in Indochina, 1945-1954 (University Press of Kentucky, 488 pp., $60, hardcover and Kindle). The book is based on “declassified contemporary French official documents and U.S. intelligence material,” as well as “reports and memoirs of French participants and Western observers,” plus a wide range of secondary studies, Schrader says. Viet Minh sources are limited to contemporary documents captured by the French, POW interrogations, and the writings of Ho Chi Minh and Vo Nguyen Giap. Maps, tables, figures, and photographs abound to support the text. The book’s first half explains the influence of Vietnam’s terrain on troop movements. Most of the fighting took place in the Red River area of North Vietnam, then called Tonkin. The rugged terrain stymied the development of a system of highways, railroads, and waterways capable of supporting large-scale military activities such as those used in World War II. Shrader goes on to discuss the disproportionate sizes of the opposing combat forces, then explains how their logistical systems were organized and operated, and compares the opposing transportation systems. He presents detailed summations of the dependency for war supplies that the Viet Minh had with what was then known as Communist China and the French Union with the United States. Helicopters were scarce and used primarily for medical purposes. Poor weather conditions, widely scattered airfields, limited numbers of aircraft and aircrews, and constantly improving Viet Minh antiaircraft capability minimized the effectiveness of the French Union air force. The Viet Minh had no air support. The book’s second half describes the war itself and how logistical factors influenced the outcome of combat operations. Initially, a series of political and military actions forced the Viet Minh to find refuge in the countryside while the French occupied the cities. From there, differing military philosophies pitted the mobility of the self-sufficient individual Viet Minh soldier against the mobility of the technologically dependent French Union army. Logistically the French relied on mechanized transportation and awaited air and sea supply shipments from France, which were often four months away. Meanwhile, day by day, Viet Minh porters carried supplies on their backs from the border with China. Shrader presents a continuous string of eye-opening stories and facts. For example, the French Union employed a third of its infantry forces in Indochina keeping roads and waterways open to traffic. Both sides had about ninety battalions in Tonkin, but the French assigned sixty-four of theirs to protecting lines of communication and rear areas, leaving only twenty-five battalions for mobile offensive operations. Basically, the French Union’s logistical effort went mainly toward resupplying posts where the troops protected trucks and boats from ambush in order to resupply themselves. Meanwhile, dispersed groups of Viet Minh porters moved nearly unopposed along trails hidden in the jungle. Reading this book saddened me—again. Much of what Shrader tells us reminded me of the American war in Vietnam. Every fact in his book was available before the United States committed itself to the Vietnam War and then more or less duplicated the French Union’s effort. What more is there to say? Since the communist takeover of South Vietnam on April 30, 1975, many writers have produced books about various aspects of the Vietnam War. 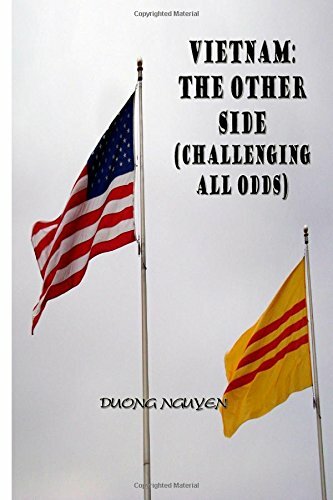 Duong Nguyen—a medical doctor who fled his homeland in 1975 and lives in the United States—presents a unique, first-hand account of a country in transition in Vietnam: The Other Side, Challenging All Odds (CreateSpace Independent Publishing, 218 pp., $23, paper). This autobiographical novel is told through the coming-of-age eyes of a child and his prosperous Hanoi family disrupted by the division of their country after the defeat of the French at Dien Bien Phu in 1954. Uprooted from their spacious and opulently furnished home, the family hastily boards a flight to Saigon. never to return. Attempting to minimize the trauma, the main character Dang’s parents enroll him in a prestigious French school in which Vietnamese is considered a foreign language and the history curriculum emphasizes all things French. Dang relies on news reports on the war as it intensifies after 1964 with the American involvement. Dang has some difficulty adjusting to his southern neighbors and is teased about his accent, but this criticism later subsides. The culture in Saigon is corrupted by the arrival of Americans and their PXs and the black market and everyone’s desire for consumer goods. Many families resort to prostitution and profiteering just to survive. Amid this “westernized” Saigon atmosphere Dang completes high school and passes his medical school admissions exam even though his first choice is to be a pilot. school Dang meets his first love, a Peace Corp physician named Mary. To reveal the outcome would spoil the book for readers. Finishing two years of combat duty Dang is transferred to the Air Force at Phan Rang just prior to what he describes as the “debacle.” Dang witnesses the sudden and final collapse of The Republic of South Vietnam. Dang joins many former ARVN troops and South Vietnamese government officials in communist re-education camps after he decides to register with the local police station. He tells his family: ” I will be back in a couple of days.” But he is held for three years. When released he is relatively healthy but extremely underweight. This begins the novel’s most action-packed and suspenseful section, the page-turning conclusion. 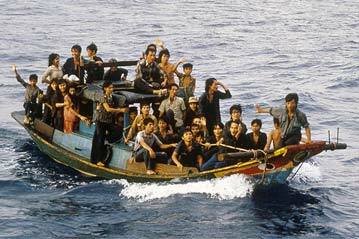 The reader will be taken back to the days of the Vietnamese “Boat People,” a situation that is sadly similar to the plight of refugees in Europe today. The author, Duong Nguyen, enlisted in the U.S. Army after migrating to this country, and commanded two medical units and was Division Surgeon of the 1st Armored Division during the first Persian Gulf War. The cover of Patrick Lee’s Kickers: A Novel of the Secret War (CreateSpace, 380 pp., $13.95, paper) depicts an airdrop In Laos. It shows a package, probably rice, dropping after having been booted out of a low and slow-moving airplane. This novel is about the recruitment of young smoke jumpers by the CIA to do this job, known as kicking. Patrick Lee interviewed smoke jumpers fifty years ago, and uses those characters and their stories as the material of this novel. Lee, who practiced law in Washington, D.C., for forty-five years and now lives in Idaho, is a former smoke jumper himself. He made twenty-five parachute jumps into the Idaho Primitive Area fighting forest fires. The novel starts in 1954 with a CIA agent and twenty French soldiers jumping into Dien Bien Phu as replacements for the dead. After the men land, they find themselves walking on the rotting corpses of those they are there to replace. Lee sets this scene of the French losing at Dien Bien Phu as well as any of the many authors I have read who have dealt with that subject. The novel presents us with alternating chapters that go back and forth in time. One of the smoke jumpers ends up as a captive and we get details about how he is treated by his captors. Suffice it to say they do not treat him kindly. We also get a lot on the back stories of the main characters going back to childhood. We know them, and when awful things happen to them, we miss them. The reader learns a lot about how the CIA chose, recruited, and trained the smoke jumpers to become surrogate warriors. They were taught to how to eat snakes, what to do when they ran out of water, how to behave when captured, and how to endure lectures from brainwashing captors. We follow them to Saigon, to Tu Do Street, and into bars where they do what young men do in such circumstances. We follow them from the early years of the war to 1968 when LBJ announces his resignation from the presidency. Lee is a good storyteller. He keeps the reader involved in the tales of these young men who were hired to kick thousands of pounds of rice out of airplanes to feed the Hmong fighters on the ground in Laos while they fought communists. If you are looking for a novel about the not-so secret CIA war in Laos and the involvement of the smoke jumpers this book is for you.